IN BOTH Ukraine and Russia, where most Christians follow the old calendar and therefore celebrate the Nativity of Christ on January 7th, this was a Christmas like no other, whether for ordinary folk or for the high and mighty. Snow was falling on the green domes of Kiev’s Saint Sophia cathedral, a building that goes back to the dawning of Slavic Christianity a millennium ago, as Ukraine’s President Petro Poroshenko and Metropolitan Epifaniy, primate of a freshly constituted church, walked together towards the ancient doors. They were carrying a document or “tomos” granting the new church independence from Moscow; they had received it in a series of elaborate ceremonies over the weekend in Istanbul, at the behest of the Patriarch of Constantinople, the Orthodox hierarch whose predecessors inspired the Slavs to become Christian. 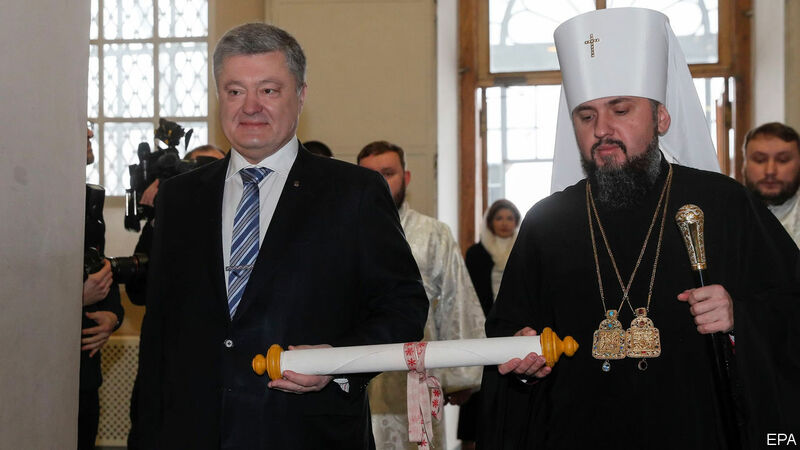 At the end of the service, attended by many top politicians and parliamentarians, Mr Poroshenko stood in front of the tomos and declared today a “double holiday” marking both Orthodox Christmas and Ukraine’s receipt of church independence. People agreed that this was a political win for the Ukrainian President who faces a tough re-election campaign. “My view of Poroshenko has increased because of this,” declared Ivan Mohylevets after taking a selfie in front of the church gate. In Moscow, meanwhile, Christmas celebrations were tinged with dismay over Ukraine’s declaration of independence, which is regarded by the Russian Orthodox church, largest of the 14 churches that make up world Orthodoxy, as a flagrant violation of canon law. As political and religious leaders in Russia see things, the Ukrainian move portends persecution for believers in Ukraine who remain loyal to Moscow. President Vladimir Putin has said the church schism could “turn into a heavy dispute if not bloodshed”. Vladimir Legoyda, a Russian church spokesman, posted a statement calling the tomos “a piece of paper” with no authority, arguing that it was signed in breach of the rules governing relations between Orthodox churches. He also accused the Ukrainians of trying to “steal Christmas”. Russian state television, dubbing the new Ukrainian church leadership “schismatics”, declared that the Ukrainian authorities were “trying to replace Christmas with their own holiday”. Mr Putin has mockingly termed Patriarch Bartholomew of Constantinople the “Turkish Patriarch” and suggested that his grant of independence to Ukraine was motivated by money. In fact, Ukraine’s acquisition of spiritual independence is more than a passing irritation for the Russian president. For at least a decade, he has devoted enormous effort to re-establishing Russia’s influence, whether political, commercial or spiritual, over the post-Soviet lands. This is a move in the opposite direction. Hitherto, a Moscow-aligned Orthodox church with more than 12,000 parishes has been the only legitimate Orthodox body in Ukraine. Now the new body, styled the Orthodox Church of Ukraine and in control of about 7,000 parishes, will try to woo those remaining Muscovite communities into its fold. That could be a messy business, sparking many local disputes. Much as it riles the Russian elites, the spiritual standoff has failed to arouse much passion in ordinary Russian citizens. Some 60% of Russians say they are not bothered by the Ukrainian split; even among self-identified believers, just 43% say they are concerned.